Problem solving is one of the key skills required to be successful at work, but finding speedy and imaginative solutions to the challenges and difficulties that inevitably arise is not an easy task. When confronted with a problem, all too often, we try to ‘force’ our brain into coming up with a solution. Not only is this a poor way to resource our creativity but this approach can result in stress while our mind wrestles with the problem. Straining your brain in this way will not result in a satisfactory solution. Alternatively, Mind Mapping is a far more effective way to attain clarity and answers. It will help you view the problem as a positive challenge, an opportunity to demonstrate your skills and flex your creative muscles. I am sure you are well aware that making endless lists is no help to you in problem solving. 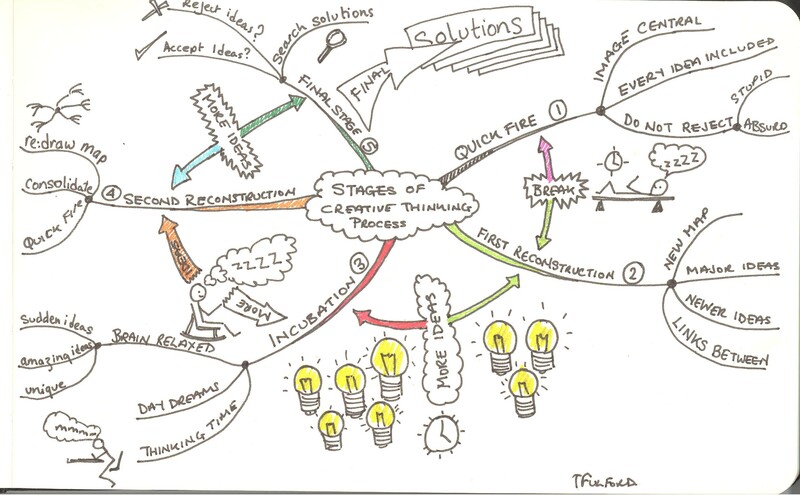 By using Mind Maps, your brain will provide you with elegant and powerful solutions. This is because Mind Maps contain all the elements of a problem in a single visual ‘take’, they show you where the real emphasis should lie and are a perfect stress- reducing tool. The colors and images appropriately stimulate your brain to the task in hand, providing you with greater mental tools to solve the problem. Mind Mapping also encourages radiant thinking and provides endless options, instead of closed thinking. 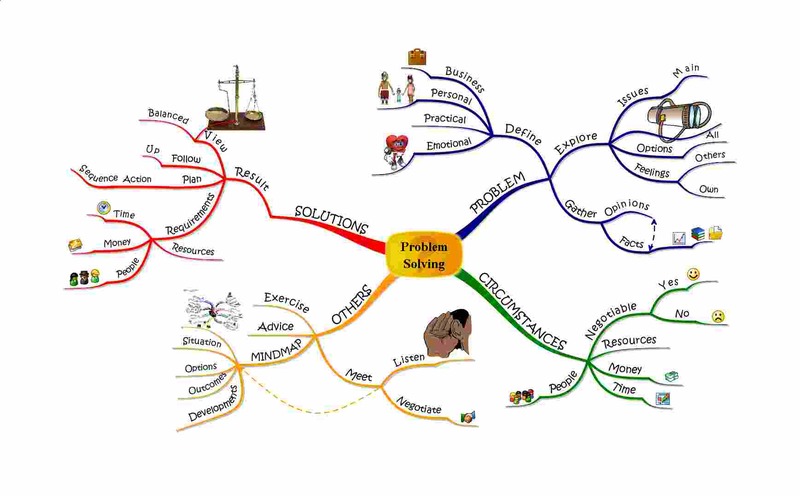 Today, problem-solving has become even easier with the development of Mind Mapping software such as Tony Buzan’s iMindMap. Such software extends far beyond the traditional capacities, creating an explosion of creativity, innovation and knowledge sharing which are all essential in solving problems. 1) Start with the problem – use the problem as a central idea and radiate thoughts, ideas and possible solutions from it. 2) Start with the solution – use the solution as your central idea and work backwards. Both methods are effective although you may be able to achieve greater clarity by drawing Mind Maps using both methods. 1) Finding a solution – you need to find a solution to the immediate problem. 2) Your team, employees, friends etc – what can they do to help? Include any advice they may give. 3) The problem – you need to analyze the problem, not only to come up with a solution but also to ensure that it does not happen again in the future. You should approach the problem calmly. You will accomplish nothing if you panic. Having created your Mind Maps, you should feel in charge of the situation since you have started the flow of creativity. The Mind Map gives you control over all the information relating to the problem, in a secure and stable framework, showing you the ‘big picture’. Even if you don’t have colored pens and paper to hand, your brain can still conjure up a mental Mind Map, a virtual picture of the situation to help you work out a plan of action. A great way to stay calm is to distance yourself from the problem by taking short breaks and then returning to it fresh and clear-headed. A short walk can be ideal for achieving this. The Romans coined the phrase ‘solvitas perambulum’, which means ‘solve it as you walk’. They believed that the combination of fresh air, removing themselves physically from the source of the problem, light physical exercise and creative inspiration from nature worked wanders if they needed to sort through issues in their minds. The state in which your imagination is able to run free is ideal for making associations on a Mind Map. By giving your brain a rest from repeatedly raking over every aspect of the problem, you will find you are more likely to come up with a solution. You are always going to be faced with problems, whether at work or home but Mind Maps enable you to rise to the challenge and turn problems into opportunities to display your creativity. Creativity is a difficult concept and skill to define, however I found this quote recently and feel at the moment this is what best describes the process for me………..
Creativity is the hidden capacity to think about ourselves, others, objects, events and circumstances in original and unique ways. Moreover, creativity allows us to overcome great odds, problems and challenges that maybe standing in the way of the success we desire to attain in life. With it, we can move mountains, part oceans and attain the heights of success. Without it, the challenges of life become more difficult and arduous to bear. Tony Buzan is the world’s leading expert on the brain and is the inventor of Mind Mapping®, the thinking technique used by over 250 million people worldwide. Whilst many products have claimed to allow you to Mind Map on a computer, none have managed to fully duplicate Tony’s world renowned process. Until now that is… iMindMap™ gives you the infinite visual variety, portability, freedom, brain friendliness and effectiveness of traditional, highly proven Mind Mapping® techniques. iMindMap™ is the ultimate thinking tool which allows you to work, learn and think smarter so you can excel in any area of your life. For more information on mind mapping, free videos, additional articles and to download a free trial of iMindMap™ visit www.iMindMap.com. This information was taken from Buzan Online. Buzan material is excellent, go on try it you might find it helps you!